A week is a nice chunk of time in which to organize your goals. Personally, I like to plan my week on either the Friday or Sunday before the week starts. If I wait until Monday, it’s already too late. Start by thinking about what you need to accomplish that month and determining what portion of that bigger goal should be allocated for this week. What absolutely must get done, and what would be nice to do? Consider what is already on the calendar—your planned events, meetings and appointments—and how much time you realistically have available. Don’t set yourself up for disappointment; focus on the high priority items and define reasonable goals given your schedule. If you already have this done when you walk in on Monday morning, you’ll be able to start the week off with clarity. Even if other things pop up along the way, which they surely will, you still know your big picture priorities for the week. Once you’ve gone to the trouble to define your “must do” and “nice to do” items for the week, block time on the calendar for completing them. Don’t just try to work them in where you can because, goodness knows, it won’t happen. Don’t block off every inch of your calendar, though. You still need plenty of flex time to manage whatever happens to come up each day. But, don’t leave your weekly priorities to chance. By blocking time on the calendar to focus on them, you improve the likelihood that you’ll actually follow through. Plus, it signals to others that you’re busy during that time, which helps minimize interruption. This is perhaps my favorite strategy to help streamline your workweek. It’s done wonders to improve my productivity. The idea is simple: Assign certain types of work to be done on certain days of the week. Batching work together like this has a number of benefits. First and foremost, it helps leverage “flow.” When you’re working on expense reports, for example, your brain gets into a groove after a while. Why not work on expense reports as much as you can while in that groove on Tuesday morning, rather than trying to get back in the groove again on another day that week? Each time you have to start and stop and start again, you lose momentum. Admittedly, you might not always be able to perfectly adhere to your weekly structure; surprises and last minute requests are inevitable. But, by and large, if you can organize your week so that certain things happen on certain days, you’ll get much more done. Plus, you can even train your team on your schedule so they know when you’ll be working on things. This helps manage their expectations regarding timing. Finally, at the end of the workweek, review your progress and see how things went. Looking at the week as a whole, were you able to accomplish your highest priorities? If not, what happened? Sometimes, these things are outside of your control and you just need to accept it. But look at the situation carefully and see if there’s anything you could have done differently to organize your time more effectively. Likewise, if you accomplished everything you wanted and more, take note of what you did to help make that happen. When one week is over, another is set to begin. You always have more opportunities to try new things. 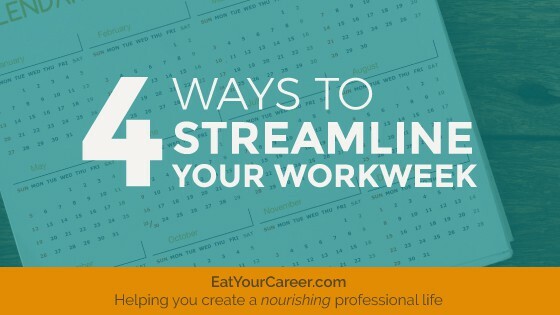 As you play with these strategies to help streamline your workweek, you’ll discover your own unique practices that work for you. Remember that no two people or workplaces are exactly the same. While we all struggle with feeling overwhelmed by “too much to do and not enough time,” there are many ways to successfully manage it.